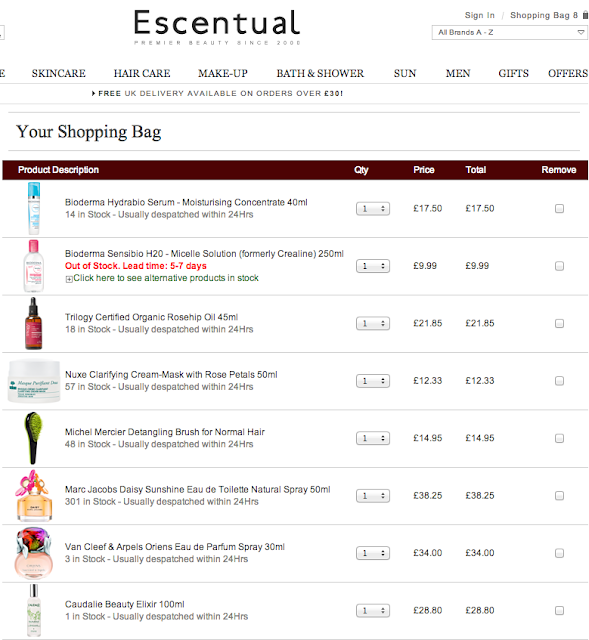 Scatterbrained Blogging: Spoil your senses with Escentual - and 10% off Bioderma! One of the curses of being an Irish beauty maniac means limited access to products, or hugely inflated prices. That rare occasion you find a pharmacy with an amazing french skincare section is like finding a fifty on the ground (except only one of those situations is a good result for your bank balance ...) but then again you have the issue of while they might have the brand, they don't have the product you're looking for. But there's this magical thing called the internet. And there is a sight, that stocks the finest french skincare, make-up and fragrance and they deliver to Ireland! It's a UK-based company called Escentual - how I hadn't heard of them before I don't know, but I plan on making up for it very soon. I'm not exaggerating when I say my heart did a bit of a skip when I laid my eyes on the site. Pictured above is my ideal shopping basket - and yes. you are reading it correctly. They. Stock. Bioderma. Bioderma is finally making tentative steps outside of the continent thanks to some beauty-savvy distributer and Escentual have got on board. So far on the sight they stock the Green (combination to oily skin) and Pink (sensitive, normal or dry skin) Micellar solutions - but as well as that they have the wider range of moisturisers and serums. For the month of March they have discounts ranging from 10-33% off French Pharmacy Brands until the end of the month. ... you're already gone, aren't you? Yes, Escentual contacted me and asked if I would be interested in featuring them. But I'm more than happy to and would have anyway if and when I came across the website myself.